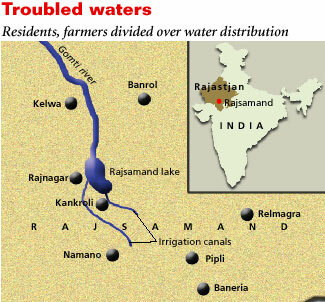 there are conflicting claims over the distribution of water of the Rajsamand Lake by residents of Rajnagar township in Rajasthan and the farmers there. The conflict began after the Water Distribution Committee of the lake decided to distribute water in a manner that did not go down well with the residents. Residents filed a petition in the high court obtaining a stay order, thus preventing water from being released for irrigation. Farmers responded by entering the town and forcing the sluice gates open. An interim order by the Rajasthan High Court seems to have pacified the resenting parties. A final verdict on the issue will most likely be given at a hearing on December 11, 2006. The conflict The 9-metre deep Rajsamand lake dried up completely in 2001 but it has filled up to 6 metres this year due to excessive rainfall in the catchment area.On October 26, the Water Distribution Committee of the lake declared that 4 metres of water should be released for irrigation and the remaining 1.5 metre retained for the town's consumption. The decision alarmed townspeople since evaporation losses alone are 2 metres per year and they fear that water level would fall below the sill level, the level at which outlets are provided for consumption of any kind. The level is a little higher than the bed of the lake to allow for siltation, which means that after allowing the water to drain out, there will still be some amount of water left over, known as dead storage. Reacting to the distribution committee's decision, the Rajsamand Jheel Jal Samrakshan Manch, an ngo, called for a bandh on October 28 and 29. Meanwhile, Sampat Ladha, an advocate representing the ngo Lok Adhikari Manch, filed a petition in the Rajasthan High Court challenging the distribution committee's decision and obtained a stay order on November 3. "We need to protect the lake. If water is drawn beyond a point, we will have the same situation as 2001 when the lake went dry. This is obvious and we cannot turn a blind eye. We have suffered enough and have depended upon others for water," says Sampat. Not finding the stay order to their taste, farmers ntered Rajnagar and forcibly opened the sluice gates of the lake to release water into their fields, besides vandalising parts of the town on Novermber 4. Apprehending trouble, authorities imposed curfew for the next two days to bring the situation under control. Farmers sow the rabi crop, predominantly wheat and barley, in these parts around this time of the year, and with the lake 6 metres full, farmers had assumed that water would be released for irrigation. "We grow wheat here and cultivation has suffered over the past few years. What can we grow without water? We have used water from wells and irrigated as much land as we could," says Khanam, a farmer from the neighbouring Ansole village. The court on November 10 gave an interim order saying 3 metres of water should be retained instead of 1.5 metre and water for irrigation should be released. According to the order, water will be released for irrigation till such a time that the water level in the lake is above 3 metres. After that it is to be used only for drinking. According to the irrigation department, the volume of water put aside for farming is enough to service 40 per cent of the command area. Service network The lake has always been used for irrigation and the canal network services 42 villages covering an area of 7,284 hectares. When the lake was dry, residents used the Nand Sagar Lake located about 15 km upstream. Bore wells were also drilled into the dry lake-bed to extract water for the town. Tej Razdan, secretary of the Jheel Sanrakshan Samiti, an ngo in Udaipur, feels while drinking water is critical, one cannot overlook the ecology of the lake either. "In a year, 2 metres of water is lost to evaporation and seepage. When water level falls to 3 metres, it should be used only for drinking. And when the level falls to 2 metres, it should not be touched, otherwise we will be killing the lake," says Razdan. At the time of construction of the lake (see box Ancient glory), there was no provision for sluice gates. Irrigation water was supplied by means of a lift irrigation system. The British built the first sluice gate canal, 8 km long, and post independence, around the 1960s, an ambitious second one was added, which was 35 km long. Needless to say, the lake was never the same again because the purpose for which it was built, to store water during years of normal rainfall and then use these reserves to tide over the drought years, was defeated. With the sluice gates functioning full-scale, the amount of water filled up during a normal monsoon was drained completely through these canals. Besides, there are other problems such as mining and check dams upstream that affect the river's water table. Areas upstream of the lake are mined extensively for dolomite--a rock that is often passed off as marble. The scale of operations is huge and Rajsamand is gaining a reputation as the "marble" capital of the world. While this provides employment to the local people, it also has its flip side. Abandoned marble quarries act as reservoirs for rainwater thus blocking off copious amounts of water into the lake. Moreover the bases of these quarries are solid rock and water cannot percolate down into the ground either. Eventually, the water just evaporates. The other problem is marble slurry, a by-product of the marble cutting process. Finding no way to dispose this, manufacturers have resorted to dumping marble slurry on dry stream beds. Over time, due to evaporation, the slurry thickens into a kind of paste that chokes the streams, which flow into the lake. The countryside is dotted with glacier-like patches of white marble waste. This region has 10 rainy days in a year on an average and with drainage channels in a complete mess the lake suffers. There is also the danger of this slurry getting washed into the lake. This would not only cause heavy siltation but also impede the downward percolation of lake water. During the last five years, groundwater has been used extensively and needs to be replenished, but this may not be happening with marble powder lining the lake-bed. There are ways of reusing the marble slurry to make bricks and tiles but local people feel the government needs to take the initiative.Construction of over 100 anicuts or check dams in the upstream area is also a major factor for the reduced flow of water into the lake. Responding to a petition filed by Abdul Rehman in 2004, the high court directed the state to undertake a general survey of the catchment area. Based on the findings, the court ordered the dismantling of anicuts that were more than two metres high. However, local people claim that this has not been done. According to the irrigation department, out of the total catchment area of 500 sq km, about 88 sq km has been intercepted. The present truce is an uneasy one and clearly, the problem remains.